By partnering with Amplitude and Braze, the Postmates team was able to build an effective stickiness strategy with a unique external trigger. Postmates is the largest, most reliable on-demand delivery and pickup platform. Able to deliver anything from anywhere, Postmates is the food delivery, grocery delivery, whatever-you-can-think-of delivery service to bring what customers crave right to their door. Postmates’ product north stars are centered around making local inventory easily accessible to everyone. One way the Growth Marketing team supports these metrics is by making Postmates more sticky. The team has to figure out how to develop the right kind of triggers to help users repeatedly see the value of their platform, while also maintaining an impeccable customer experience. According to data from Braze, users who receive messages from brands using a single channel (either email, push, or in-app messages only) saw average engagement levels that were 179% higher than users who received no messages at all. That means an email, push, or in-app message could be the difference between a lapsing user and an actively engaged customer. Knowing this, Postmates sought a versatile engagement platform that could help them increase customer stickiness, build loyalty, and increase LTV through omni-channel messaging. And, just as importantly, they needed a way to measure how their customers were behaving in response to those messaging campaigns. Product and marketing partnered worked hand-in-hand to drive customers engagement, starting when they partnered with The Bachelorette on ABC. 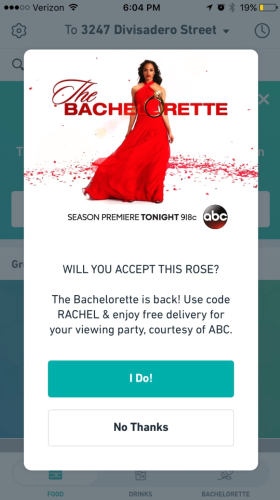 They launched a campaign where Postmates used Braze to deliver different types of “Bachelorette experiences” to their customers. Monitoring their campaign in real-time helped Postmates use their marketing budget for this campaign far more effectively. Their behavioral insights from Amplitude helped them answer where in the campaign they needed more communication and which variants were resulting in the highest conversions. Braze then allowed them to iterate on their messaging in real-time, driving more effective customer engagement. Postmates connects customers with couriers who offer delivery from local businesses in just minutes. Postmates needed to figure out how to develop the right triggers to help users repeatedly see the value of their platform. By using Amplitude and Braze, Postmates was able to create meaningful, engaging experiences that keep customers coming back.